EMSB 2017-2018 FINANCIAL STATEMENTS: The 2017-2018 audited financial statements were deposited at a recent Council meeting. The operating surplus for 2017-2018 is slightly under $1 million. This amount is added to the accumulated surplus, which Council can appropriate at the rate of 15 percent per year for the next two fiscal years. Council was pleased to be able to use close to $6.5 million from the June 30, 2017 accumulated surplus in 2018-2019 for continued services to directly benefit students, including the introduction of new initiatives as well as direct allocations to schools for improvements to schools and centres. Deputy DG Benoit Duheme, Pietro Mercuri, Deputy DG Evelyn Alfonsi, Joe Ortona, Ann Marie Matheson, Mubeenah Mughal, Norm Gharibian and Andrew Ross. NEW PARENT COMMISSIONERS: Prior to the last Council meeting, a special pinning ceremony was held for the new parent commissioners: Pietro Mercuri, Elementary; Norm Gharibian, Secondary; Mubeenah Mughal, ACSES; and Andrew Ross. SPECIAL MEETINGS: The proposal to create a new Français Plus school and relocate Focus and Outreach Schools to James Lyng High School in St. Henri and another to relocate the students from Westmount Park Elementary School to the Marymount and St. John Bosco facilities are presently out for consultation. The EMSB Council of Commissioners will convene on January 9 to listen to comments from those bodies that are being consulted, with votes scheduled for January 16. A look at the new school sign format. NEW SCHOOL SIGNS: The EMSB plans to introduce new signs for each school and centre building. However the process really got underway with the new Mackay Centre and Philip E. Layton School facility. Their new sign was installed two weeks ago and will serve as a template for others. Ponctuation Grafix undertook the design in conjunction with an EMSB Marketing focus group and the Council of Commissioners. Conference organizers, EMSB representatives and student volunteers. PARENT CONFERENCE: The EMSB Parents Committee held another highly successful third Parent Conference on Saturday, November 17 at the St. Laurent Adult Education Centre. It was a free event and featured 20 workshops dealing with a wide variety of issues faced by children and teenagers and how parents can learn how best to help. 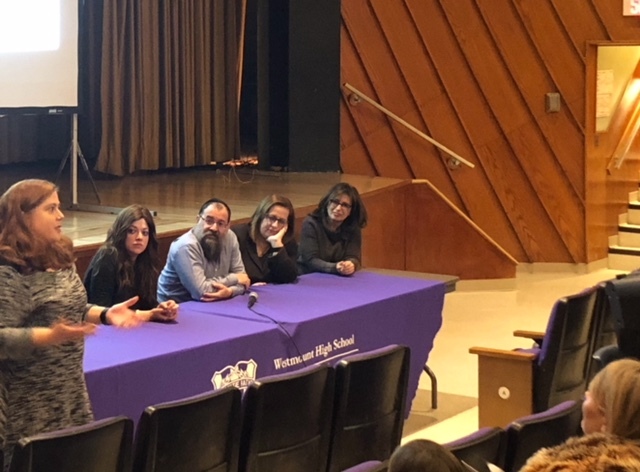 Among the workshops were topics such as understanding the new sexuality education program, what parents should know about cannabis and teens, dealing with bullying, helping kids through anxiety and stress, how to make literacy fun, how to motivate teens and advice for those at-risk and for those already excelling. EMSB Director General Anne-Marie Matheson opened the conference by saying that what binds the school board is the coming together of different communities to work for common goals; the education and well-being of the board's students. Norm Gharibian, conference co-organizer and EMSB Parent Commissioner, said he was extremely satisfied with how the day went. "I think it was an amazing day," he said. "We had great presenters, great participants. The food was right on the mark and I think a good time was had by all.” See our complete story with more photos. And see this report from CTV. NEW PARENTS COMMITTEE CHAIR: It’s only been a few weeks since Joseph Bondi (pictured) was elected chairman of the EMSB Parents Committee, but he has a clear vision about the future and the issues on the table. Mr. Bondi, 52, became chairman by acclamation in October. "That was fine," he said. "It was a vote of confidence from everyone." Mr. Bondi joined the Parents Committee at Dunrae Gardens Elementary School in the Town of Mount Royal when his daughter, now in Grade 5, was in Grade 1. The director of a software company by day, he said there are several reasons as to why he is so involved with the EMSB. "To me, education is very important," he said. "My dad was actively involved in parents' committees...I have three siblings, I'm the oldest, and my dad was on parents' committees for all four of us, from when I was in first grade until my sister graduated high school. That was over 20 years. "He was busy working. But he took the time. And it made me realize that education is important, very important. And it's not just about education. I truly believe in the old adage 'it takes a village to raise a child.' The only way you do that is through stewardship, volunteerism, you do it at the school level, the grassroots, you help out, be part of different committees, different activities and every little bit helps, right?" 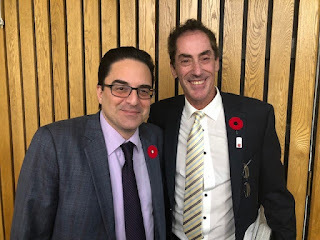 Among the challenges for Mr. Bondi going forward is to continue to fight against the possible abolition of school boards, to help attract more students to the EMSB as well as funding issues. Mr. Bondi has a one year mandate and a pretty full plate. Michaela Di Cesare with Commissioner Lattanzio, staff and some students. PLAYWRIGHT/ACTRESS RETURNS TO LMAC: Actress Michaela Di Cesare returned to Laurier Macdonald High School in St. Léonard on November 26 to speak to a creative writing class about her career. Commissioner for St. Léonard and City Councillor Patricia Lattanzio was on hand and took part in the program. The class, taught by Alessio Giancola, is actually working on script writing at the moment so the timing was perfect. Ms. Lattanzio asked Michaela if she would consider coming back to the school as a mentor, to which she agreed. Here is a link to the CTV report on her visit. Michaela holds an MA in Theatre from the University of Toronto and an undergraduate degree in Creative Writing & Theatre from Concordia University. She has appeared in many movies, television shows and stage productions and writes her own plays as well. Presently, she is starring in the play Gratitude, which runs until Dec. 2 at the Mainline Theatre. The provocative storyline revolves around 15 year old Dariya, who attends an exclusive Montreal private high school. The elements of first love, peer pressure, sexual identity and cultural discrepancies are woven into the script as well. While the show is recommended for those aged 16 and older, Director Oren Safdie ensured that everything is done tastefully. Michaela, who is much older than 15 in real life, portrays Dariya. “This play is a crucial examination of what happens to young women when autonomy and choice are taken away from them,” she said. For more information call 514 849-FEST (3378) or log on to mainlinetheatre.ca/en/spectacles/gratitude. SEXUALITY EDUCATION: EMSB Sexuality Education Consultant Jamie Quinn continues to be very much in demand by the media to discuss the new curriculum. Here she is on Breakfast TV. 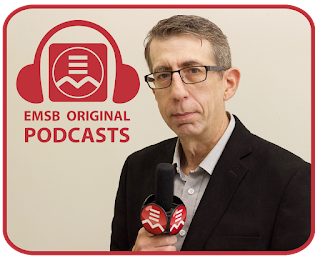 THE EMSB PODCAST: Please log into the new and very popular EMSB Podcast, effectively our own radio show. It is hosted by longtime broadcast personality Barry Morgan and can be accessed at https://soundcloud.com/englishmtl/sets/emsb-podcast. Just click on the topic that interests you. EMSB technology consultants assist students succeed, as well as being directed to resources aimed at helping parents in assisting their children. Click here. An extraordinary talk about the new Sexuality Education program with EMSB Consultant Jamie Quinn, LBPHS Teacher Paul Karpontinis and two very bright, young students from FACE and VMC at Lester B. Pearson High School in Montreal North during their monthly EMSAC meeting. Click here. 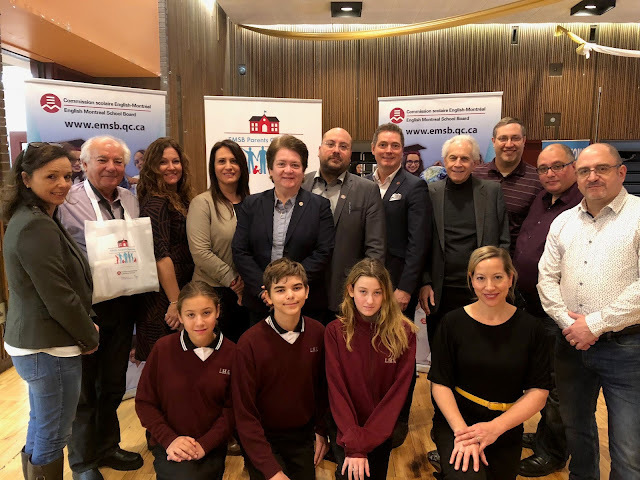 SPIRIT OF GIVING: In preparation for the holidays, the EMSB will once again be teaming up with CTV Montreal for the annual “Spirit of Giving” campaign, which brings much needed assistance to the less fortunate throughout Montreal. More than 40 schools and centres will take part in the campaign as well as some community organizations. 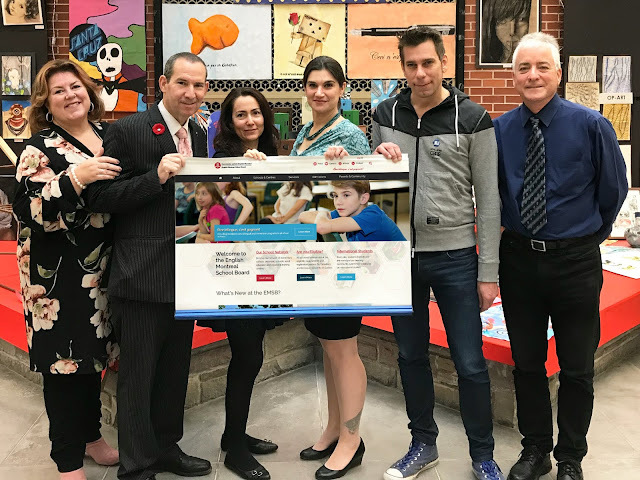 Many of the participating EMSB schools will organize a series of events set to encourage donations, and a number of schools will be featured on CTV Montreal’s mid-day and nightly news programs throughout the duration of the campaign. The campaign will begin with a live broadcast from a school to be determined on Thursday, December 6 at 12 p.m. and conclude with another live broadcast from John Paul I High School in St. Leonard on Thursday, December 13 at 5 p.m. For highlights of the 2017 campaign, please watch this video. Here is the 2018 promotional spot. CAREER FAIR VIDEO: Barry Morgan and Daniel Smajovits put together this report on the recent EMSB Career Fair. Students at St. Monica Daycare actively involved and enjoying their Harvest Party! HARVEST PARTY: The Before and After School Enriched (B.A.S.E.) Daycare Program Green Clubs have a tradition of celebrating the harvest from the school gardens each fall in an annual Harvest Party. 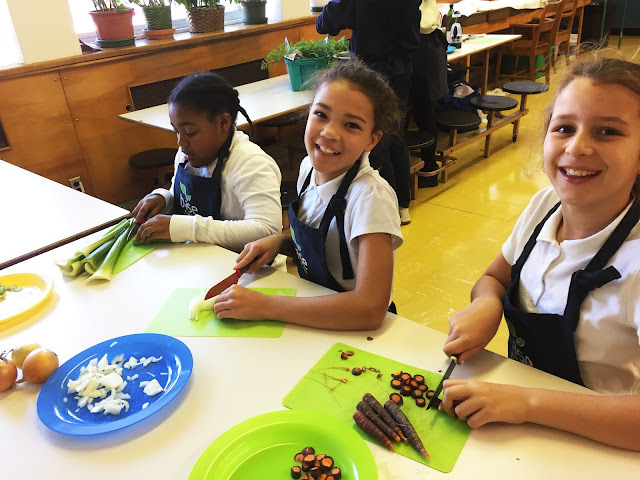 The festivities are centered on connecting the school community to their garden and promoting healthy eating through preparing nutritional meals. Other benefits include engaging staff, students and parents with the garden as well as enriching students with life skills through hands-on learning experiences in gardening and cooking. B.A.S.E Daycare Green Club students celebrated this year’s hard work in their gardens with Green Club Coordinator Ryan Oxley at their Harvest Party where they made delicious food and decorated and played games. Vegetables that were part of this year’s yield include carrots, kale, lettuce and pumpkins. To set the tone for their harvest celebrations, students decorated with pumpkins, scarecrows and vegetables to create a festive atmosphere using all recyclable materials. Students at Parkdale Elementary School in St. Laurent prepared homemade pizza from scratch, while students at St. Monica Elementary School in NDG harvested vegetables from their garden to make soup. 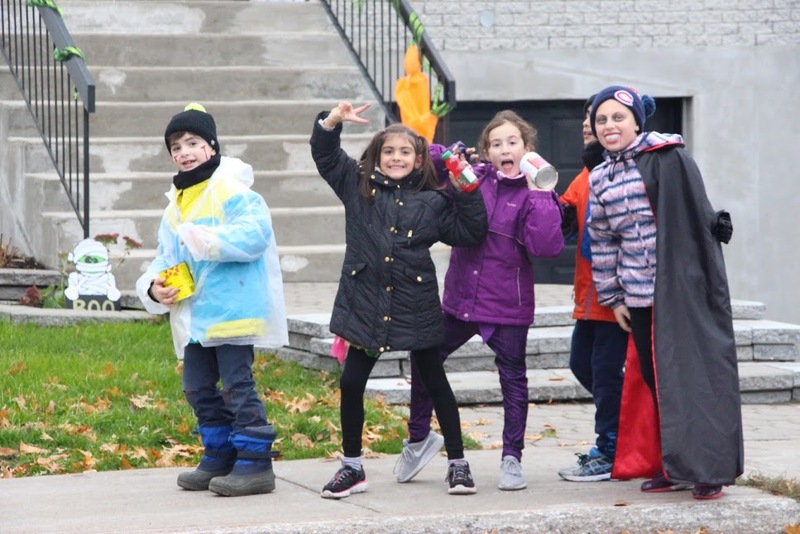 Students at both Cedarcrest Elementary School in St. Laurent and Hampstead Elementary School played fun games such as pumpkin stacking and garden ball toss with pumpkins that they grew in their school gardens! SCREENAGERS: The Westmount High School Administration and Guidance team were pleased to be able to hold a parent evening regarding healthy use of screen time on November 15. The documentary Screenagers was shown, followed by a panel discussion with the audience. On the panel were Principal Roberto Di Marco, Vice-Principal Matthew Shapiro, Guidance Counsellor Mandy Moreno, Chabad Lifeline Director Rabbi Benyamin Bresinger, Chabad Lifeline Youth and Addictions Counsellor Abby Deloyua., School Psychologist and EMSB Mental Health Resource Centre Coordinator Despina Vassiliou and EMSB Violence Prevention & Health Promotion Consultant Daphna Leibovici. WHS would like to thank our experts as well as our families for participating in such a wonderful evening! Students work on their project. 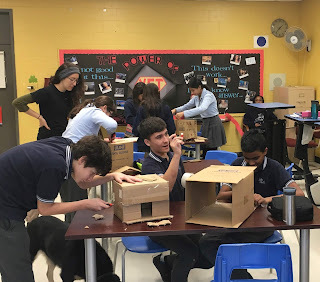 ANIMAL WELFARE EDUCATION: Students at John Paul I Junior High School in St. Léonard have been exploring the feelings and needs of companion animals. As part of a 20-hour empathy-building program offered by ENGAGE: Animal Welfare Education, the students have been improving the lives of animals in Montréal with creative animal welfare projects and getting involved with the Montreal SPCA. One workshop had participants build hiding boxes for the animal shelter’s nervous cats who are waiting to be adopted. The ENGAGE program ends with a day at the Montreal SPCA where students practice what they’ve learned as they work directly with the animals in the shelter. ENGAGE is also coordinating weekly Tuesday (4 pm to 6:30 pm) workshops at the Montreal SPCA with students from Royal West Academy. Info: Colleen Ovenden, 514 999-9465, colleen@engageanimal.org or http://engageanimal.org. East Hill students collect non-perishable food. WE SCARE HUNGER: This Halloween season, children at East Hill Elementary School in RDP were sensitized to those in need and learned how to work together as a community. Ethics teacher Luciana Clarizio and Spiritual Animator Rocco Speranza organized the annual collection food drive known as "Scare Hunger." Students contributed to “Scare Hunger” by bringing in non-perishable food items during the two weeks prior to Halloween. On Halloween, the entire East Hill student body partook on a Zombie Walk, coordinated by Mrs. Clarizio and Vice Principal Jessica Monti. The aim of this walk was to collect additional non-perishable food items that neighbours set out on their porches for this day. Police officers from Station 45 as well as the Caserne 44 firemen crew also helped with circulation in the streets. These items were later paired with the school's collection and given to several charities in the Rivière-des-Prairies region. The Dutch delegation is greeted. 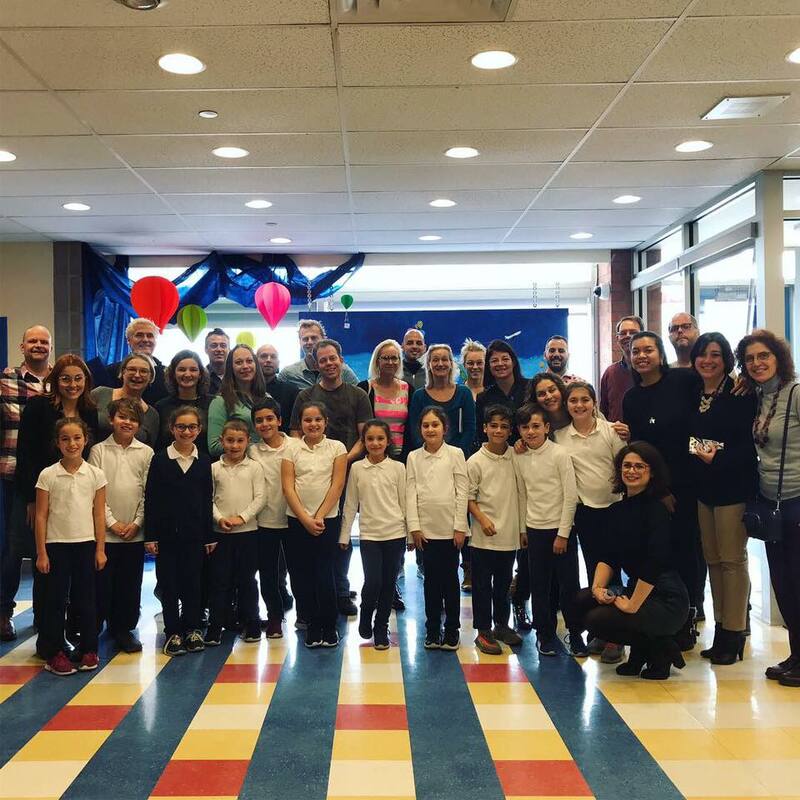 DUTCH DELEGATION: On November 15, East Hill welcomed these professionals into their school with much pride. Educational leaders in the Netherlands are currently exploring a Dutch-English model of bilingual education, and were absolutely blown away by the students’ ease and fluidity in both English & French, not to mention the complementary Italian. Staff and students welcomed the Dutch guests into their classrooms and into their hearts. They deeply enjoyed their experience and felt they had a world of innovation to take home! EMSB Director of Education and Technology Services Sandra Furfaro also assisted and coordinated this beautiful project. The Dutch delegation also sought innovation by visiting Rosemount High School and St. Pius Culinary Institute. What an honour! 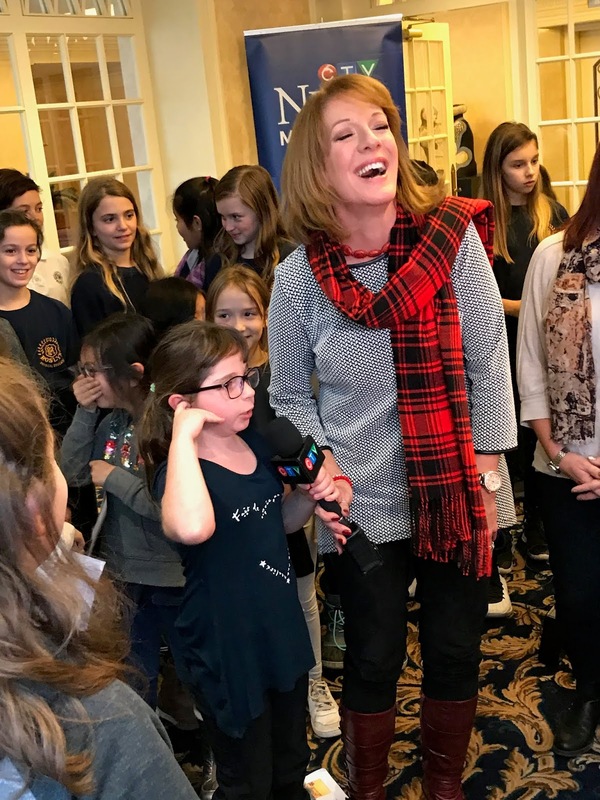 HALLOWEEN AT CARLYLE: Catherine Verdon-Diamond of Breakfast TV stopped by Carlyle Elementary School in TMR for Halloween and filed this report. Lester B. Pearson High School students scare hunger. WALK FOR HUNGER: Continuing an annual tradition, students from Lester B. Pearson High School in Montreal North took to the streets to raise awareness for hunger issues in the community. Throughout October, students collected nonperishable goods which will be shared with local charities and individuals in need. Danius Puras is welcomed to the school. 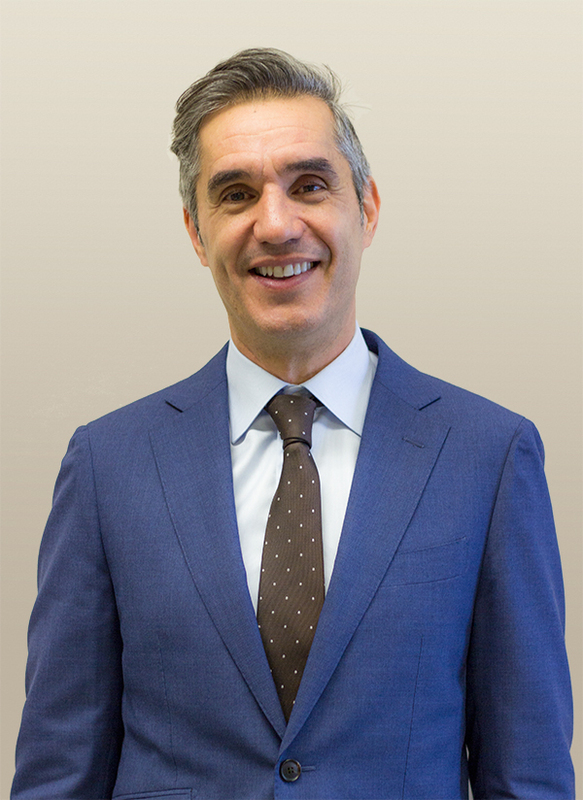 UNITED NATIONS REP AT PEARSON: Lester B. Pearson High School in Montreal North recently welcomed Dainius Pūras, the United Nations' Special Rapporteur on the right of everyone to the enjoyment of the highest attainable standard of health. Mr. Pūras spoke with students about his life's work as a human rights advocate, who for 30 years has worked to transform public health policies and services, with special focus on the rights of children, persons with mental disabilities, and other groups in vulnerable situations. Additionally, Mr. Pūras held a roundtable discussion with EMSB officials and teachers to listen to our school board's efforts to safeguard the rights of our students. 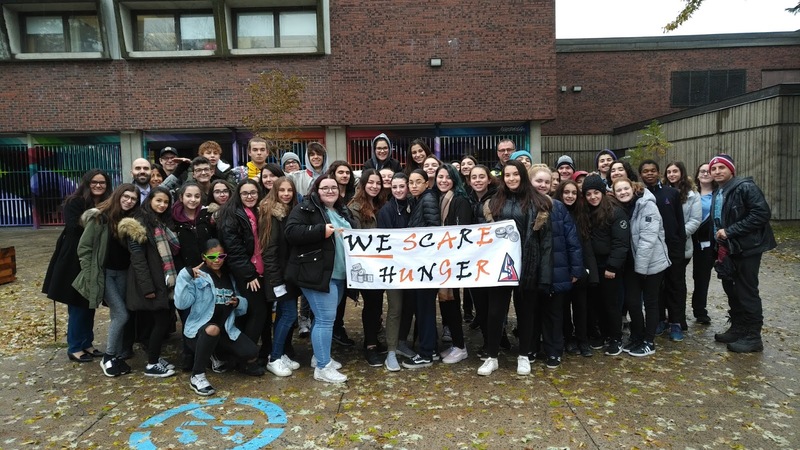 TOUR FOR HUMANITY: In late October, students at Lester B. Pearson High School were the first in Quebec to visit the Simon Wiesenthal Center’s Tour for Humanity Bus, spending an hour in the organization’s 30-seat state-of-the-art mobile human rights education centre. On board, students learned about diversity, democracy and Canadian civil rights and responsibilities. The purpose of the Tour for Humanity is to inspire people of all ages and backgrounds, empowering them to raise their voices and take action against hate, intolerance and bullying and to promote justice and human rights. EBS ON TV: Watch the staff and students of Elizabeth Ballantyne Elementary School in Montreal West (incorrectly indentified as Côte Saint-Luc) star in this animated French-language TV show. I LOVE TO READ AT EBS: November is “I love to Read Month,” and Elizabeth Ballantyne Elementary School in Montreal West has been participating in a series of reading related activities to encourage the students to read as often as possible, and to essentially fall in love with reading. This year, in order to support the theme of their annual book fair and to demonstrate the magical adventures that children can experience while reading, their theme has been an enchanted forest! As such, the hallway to the gym was transformed into a beautiful enchanted forest where imaginative characters like fairies, wizards, and elves can exist! To kick start our “I Love to Read Month,” the students walked through the enchanted forest and entered the gym to see a play based on the tale of a wizard and three fairies, played by Principal, Michael Brown, and behavior technicians Miss Roen, Miss Carmy and Miss Kate. It was during this play that the students received their first reading task as well! The grand wizard told the tale of two fairies who were banished from the enchanted forest to a dark place by the evil fairy. The students were then told that it is up to them to rescue the fairies from the dark place. The grand wizard explained that every time a class reads 50 books, a footprint would be given to bring the fairies one step closer to their home. SHINE: On October 24 the Spiritual Care and Guidance and Community Involvement Service received “SHINE” training from the Missing Children’s Network. 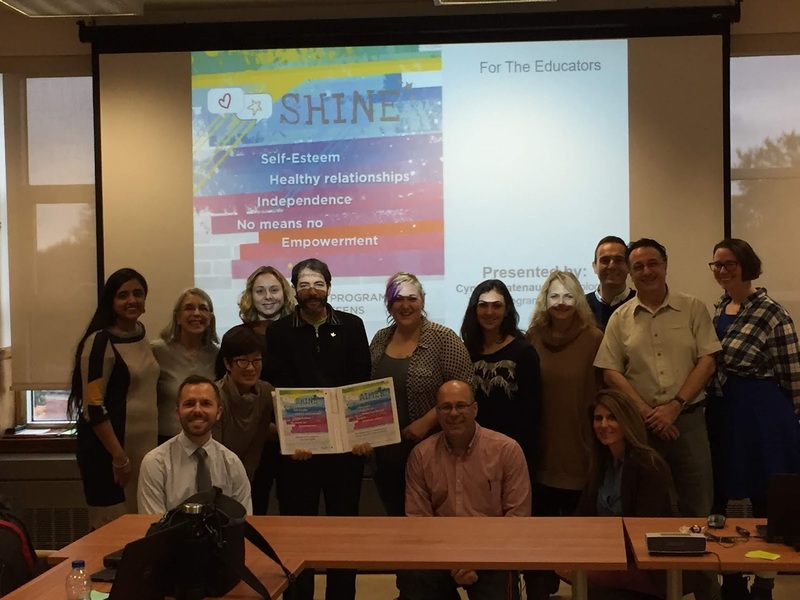 Created last year, the program was designed to help students develop Self-esteem, Healthy relationships, Independence, understand that No means no, and become Empowered (SHINE). These topics are highly relevant as they are included in the Quebec government's new sexuality education curriculum. The Spiritual Care and Guidance and Community Involvement Animators are now qualified to lead the SHINE trainings in their schools. They will be working in partnership with the Missing Children’s Network to get this important message out to their students. EMSB and school reps join guests and students at the big ceremony. REMEMBRANCE DAY: More than 700 students took part in the EMSB’s largest Remembrance Day celebration to date at the Royal Canadian Hussars on Côte-des-Neiges Road on November 7. Students from six EMSB Schools: Laurier Macdonald High School in St. Leonard, Lester B. Pearson High School in Montreal North, Marymount Academy in N.D.G, Perspectives I and Perspectives II High School in St. Michel, and Rosemount High School were on hand to commemorate the 100 year anniversary of the World War I armistice, the 101st anniversary of the Battle of Vimy Ridge and the 80th Anniversary of Kristallnacht. Additionally, students heard from 98-year-old Holocaust survivor and Canadian Veteran Willie Glazer. Mr. Glazer also lit six candles honoring the six million Jews who were murdered in World War II. See our roundup of all the Remembrance Day ceremonies. STAFF NEWS: Christine Denommée is leaving her post as Director of Human Resources for the EMSB to assume the role of Director of Labor Relations at CPNCA (Comate patronal de négociation pour les commissions scolaires Anglophones)…. 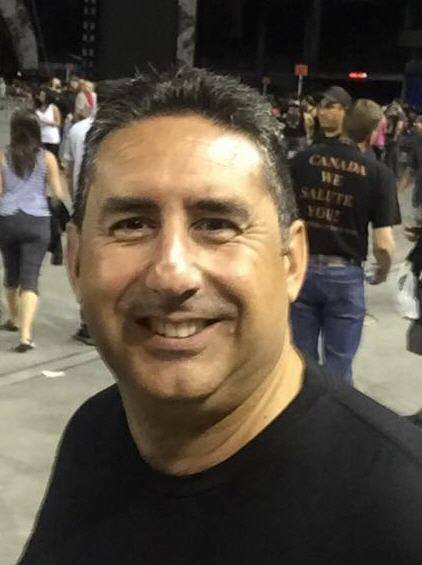 Charambalos (Bob) Thomas is the new assistant director of Education and Technology Services, succeeding Luigi Di Filippo who vacated his post to join Bombardier. Working alongside Kacem Azzouni, his tasks include overseeing the infrastructure of our software and ensuring the equipment and network runs smoothly. A former teacher, he was a pedagogical consultant and IT director for the Riverside and New Frontiers School Boards. 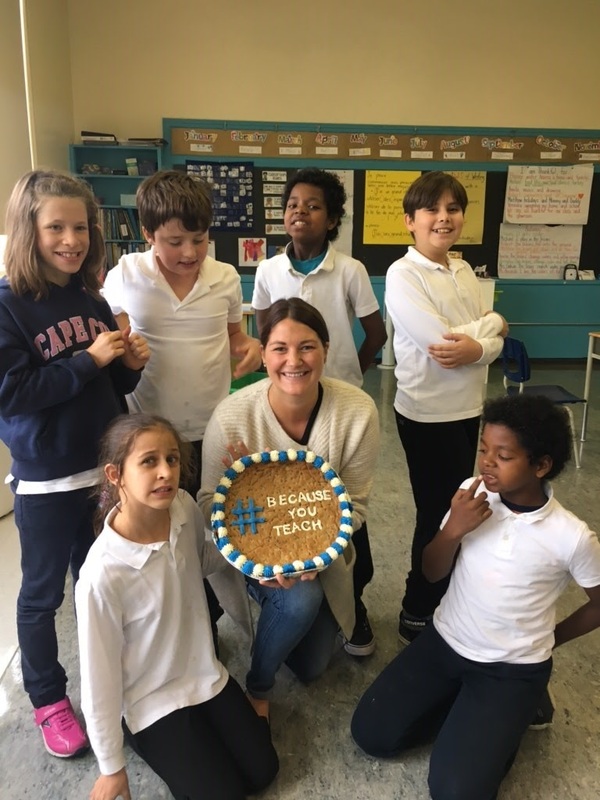 BECAUSE YOU TEACH CONTEST WINNER: Coronation Elementary School Teacher, Amanda Dandy won the Microsoft Canada’s #BecauseYouTeach Contest. Microsoft expressed their gratitude on World Teacher’s Day that Canadians nominate an instructor who enriched learning, inspired students, and fosters an inclusive learning environment. A Coronation Elementary School parent nominated Ms Amanda as she saw all these qualities in her. As part of the award the Microsoft team will be going to Coronation to celebrate with Amanda by throwing her a thank you party to show their appreciation for the work she does in her ASD Senior classroom. This celebration will include a staff luncheon, a surprise gift bag, and a celebration banner. A warm congratulations to Ms Amanda! visited a number of EMSB schools recently, educating students on the wonders of space and the rigors of becoming an astronaut. 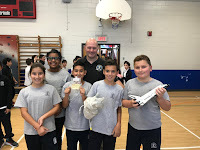 In addition to his incredible stories accumulated from years of training astronauts, Ewenson awed students with dozens of items used in spaceflight such as meals and equipment. See our video. STONE SOUP: On October 18, Spiritual Care and Guidance and Community Involvement Animator Elizabeth Pellicone completed the Stone Soup activity with the English classes of Grade 1, 2, and 3 at FACE Elementary School downtown. After reading the story “Stone Soup” by Marcia Brown, and discussing its message (to share is to care), Grade 1 and 2 students each brought a vegetable that was placed in a large cooking pot. 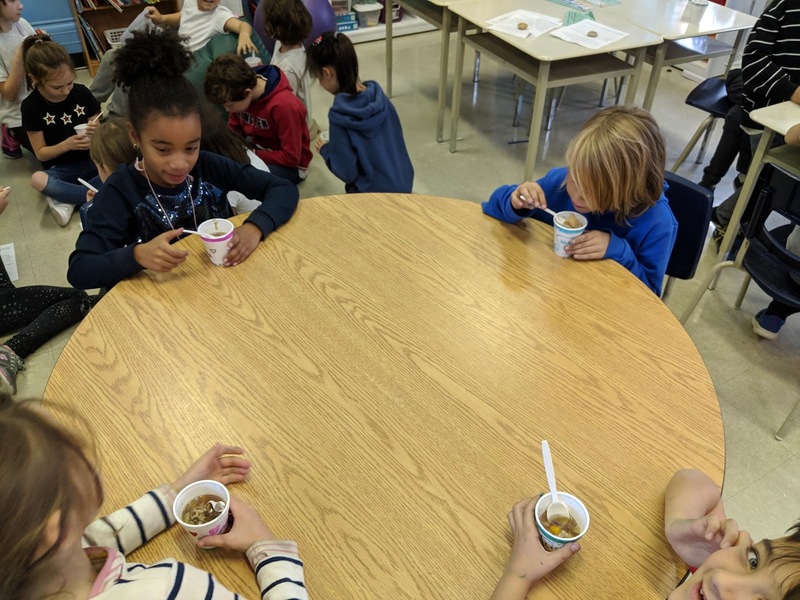 Once the soup was ready, the Grade 3 students read their own original harvest blessings to each Grade 1/2 class to bless the Stone Soup Community Meal. At the same time, after discussing the importance of community, Grade 3 students received their own stone to inscribe the virtues they believe sustain a community (love, harmony, sharing, caring, forgiveness, compassion, helpfulness, gratitude, generosity and respect). Grade 1 and 2 students received their own cup to decorate with images of what a community means to them. After all the blessings, the students in Grade 1, 2 and 3 enjoyed a delicious and nutritious cup of vegetable Stone Soup! Students took the recipe home with them to try out with their own families. Thanks to the teachers who collaborated with Ms. Elizabeth to make this event possible: Ms. Jillian, Ms. Lara, Ms. Debbie and Ms. Jasmine! KINDNESS AND MENTAL HEALTH: Spiritual Care and Guidance and Community Involvement Animator Rocco Speranza highlighted the connection between acts of kindness and an increase in positive mental health during the months of September and October. At Vincent Massey Collegiate, he teamed up with community Police Officer Constable Guay to present cyberbullying, mental health and acts of kindness workshops to Secondary 1 and 2 students. Afterwards, students from the Be the Change Committee spent their lunchtimes writing positive messages on colourful paper leaves, which were added to the school mural entitled, Don’t Leaf. 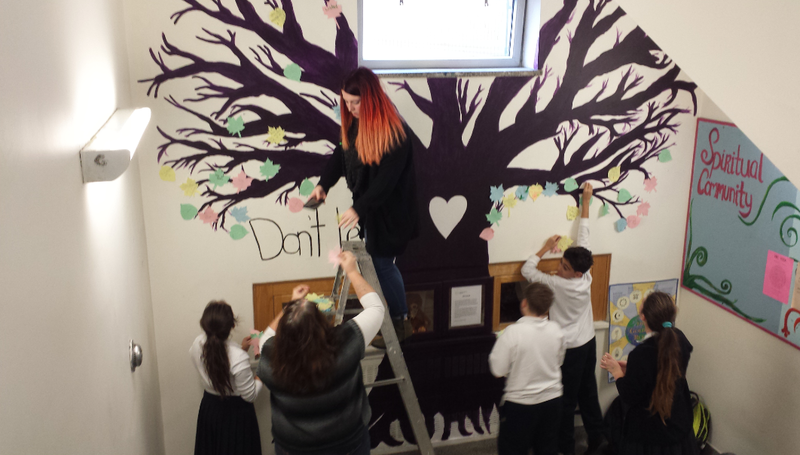 The Kindness tree at Vincent Massey. 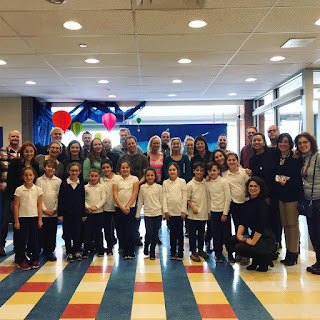 At Edward Murphy Elementary School, it was the Missing Children’s Network, along with Mr. Speranza, that presented their successful SHINE Program. The program is designed to increase kindness, confidence, and self-esteem amongst youth. East Hill students were all smiles after Mr. Speranza’s class visits, as he taught them about how spreading kindness and compassion can increase your happiness and the happiness of others. Studies on the effects of kindness have shown that with just one simple act of kindness, you can decrease stress, feelings of sadness and anxiety. At the same time, you can increase your levels of serotonin, endorphins, and oxytocin making you and others feel calmer, healthier, and happier. After these presentations, more students have become aware of the powerful effects of kindness and we hope that the wave of kindness continues to spread. Regional Director John Pevec and Bryanna Pereira. 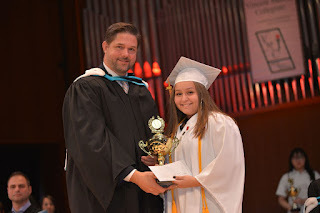 FAMILY SCHOLARSHIP: This is the second year that Vincent Massey Collegiate alumni Maria Guzzo has presented a scholarship worth $1500 to a student who, despite adversity, has done well academically. The 2018 recipient was Bryanna Pereira Agostinho. During her time at VMC, this student persevered academically and was a humble ambassador of kindness and generosity. She is a very hard worker and confronts challenges with diplomacy and poise. She truly stood out while on VMC’s service trip to Costa Rica; where her compassion and inclination to help those less fortunate were unparalleled. INFLUENCE MTL: Eight enthusiastic young ladies from Vincent Massey Collegiate recently had the extraordinary opportunity to attended Influence MTL conference that aims to promote and champion Diversity, Inclusion, and Leadership. Their mission is to Inspire + Inform + Influence the current and next generation of change makers, entrepreneurs, activists, creatives, professionals and students alike - fostering an exchange with local and international individuals of influence in order to positively impact their respective ecosystems. The keynote speaker at this year’s event was Malala Yousafzai. Born in 1997, Malala Yousafzai grew up in Northern Pakistan and from the age of 10, Malala has campaigned for the rights of girls to receive an education. In October 2012, the then 15-year old Malala was shot by the Taliban while traveling home from school on the bus with her friends. Now studying at the University of Oxford, Malala continues to campaign for the right of every child to go to school. Since the attack, she has become internationally known for her courage in refusing to be silenced and continuing her fight for the right of everyone to receive an education. Malala’s bravery and unwavering dedication to her cause has seen her honoured throughout the world, including one of the world’s highest honours: the Nobel Peace Prize. She became the youngest recipient of the prestigious award in 2014, alongside Indian child rights campaigner Kailash Satyarthi. Following the outpouring of support that Malala received throughout her ordeal, she set up an international fund – the Malala Fund – which is dedicated to help promote education for girls throughout the world. A nice partnership with the Senior Centre. SENIORS AND HALLOWEEN: On October 30 the Almage Senior Community Center hosted a Halloween Party and invited Vincent Massey Collegiate (VMC) students to attend. The center is a non-profit organization that provides services to the senior population of the East End of Montreal. After a delicious lunch, the partygoers were treated to a variety of carnival style games, everything from Hot Pumpkin, to the Witch Hat Ring Toss, to sweet tasting. Spiritual Care and Guidance and Community Involvement Animator Rocco Speranza, and a small group of VMC students, animated and led the games. The afternoon was filled with lots of laughs, as new friendships were created. Both the seniors and students had a wonderful time. A big thank you to Mrs. King and Mrs. Wright for allowing us to take part in this activity. It provided VMC youth with an opportunity to take part in a great intergenerational activity. MICHELANGELO AT CBC CANADIAN MUSIC CHALLENGE: Congratulations to Michelangelo International Academy in RDP for having their class video of "I Went to the Market" make it to the CBC Music Class YouTube channel. On December 11, the top 10 classes from across Canada in six categories will be announced. On December 18, celebrity judges will announce the winners in each category. . Through their music program, which adheres to the International Baccalaureate's research modules, students at Michelangelo become better communicators by singing in multiple languages and developing their open-mindedness by touching different styles of music from around the world. Music helps to make these students more sensitive and balanced. They learn courage during the big annual concert which takes place in a professional room with a capacity of more than 700 people. Students sing in the hallways of the school when they go into the music class, on the bus during outings, and in the monthly assemblies that highlight special events. Here is their performance. GLEE SHOWDOWN: Ten high schools from across Montreal showcased their best song and dance routines in the Just for Kids Glee High School Showdown this competition supporting the Montreal Children’s Hospital. Royal West Academy in Montreal West was profiled on Breakfast TV. Robb Nash meets with EMSB officials. MENTAL HEALTH: Members from the EMSB Mental Health Resource Centre attended a Robb Nash concert in St. Hubert, Quebec recently. Presenting to high school students across the country, Nash talked to St. Hubert students about his near death experience, shared teenagers’ stories of mental health struggles, and performed encouraging rock songs designed to give hope to Canadian youth. For those who have friends or family members with mental health issues, his message was to reach out, in a non-judgmental way, in order to provide support. For those experiencing mental health issues, he encouraged them to not give up and seek help from someone they can trust. 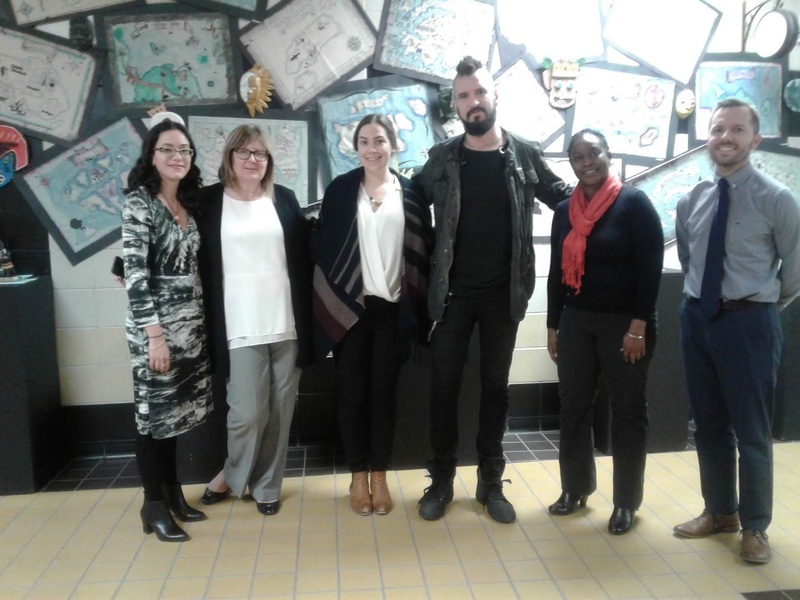 The Mental Health Resource Centre reps were so impressed with Robb Nash’s message and the impact that it had on the students that they are in the process of organizing a performance at the EMSB. 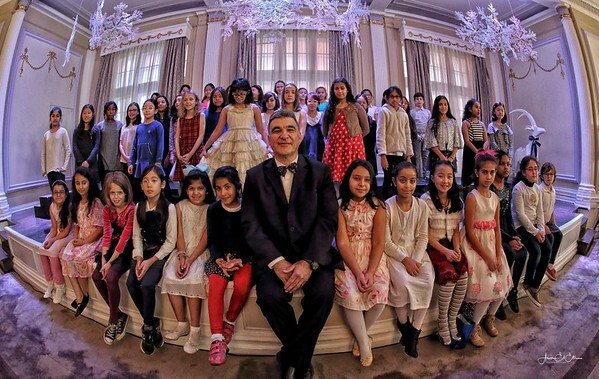 A scene from last year's Toy Tea, with the Westmount Park Elementary School Choir. TOY TEA: Students from the EMSB will once again be collecting new toys for the 27th annual Christmas and Chanukah Toy Tea, set to be held at Victoria Hall in Westmount (4626 Sherbrooke Street West) on Wednesday, December 12 (9:30 am to 3 pm). 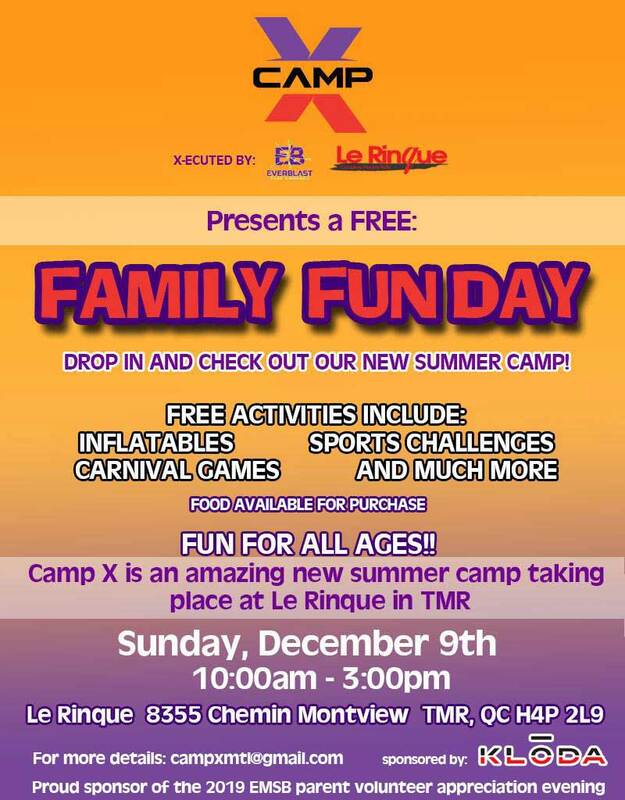 The aim of this program is to ensure disadvantaged children in Montreal have toys for the holiday season. The 2018 edition will be distributing toys to over 5,000 children living in 31 shelters for domestic abuse and violence, as well as to children at The Welcome Hall Mission, The Montreal Diet Dispensary, Tyndale St. Georges Parish, St. Willibrord’s Parish, La Rue des Femmes and Batshaw Youth and Family Services. This will be the 16th year of the EMSB’s involvement, which is an initiative of former Spiritual, Religious and Moral Education Consultant Irene Miller. For more information, log on to www.toyteamontreal.org. See our full story here. Students from Summit School and the Mackay Centre School receive Cinémas Guzzo gift certificates as thanks for bundling the most recent edition of Inspirations Newspaper. CELEBRATING A MILESTONE: Inspirations Newspaper is celebrating 10 years of servicing the special needs community of the EMSB and beyond! The Fall 2018 / Winter 2019 edition celebrates this milestone with editorials that share our journey, a special report on the new Mackay Centre and Philip E. Layton Schools, and much more. This edition is rich with inspirational stories and resources in our community. Check out the 10th anniversary quiz on page 43. Answer the 10 questions and submit your entry to info@inspirationsnews.com by December 14 and you could win a beautiful gift basket from Plant Love Grow for your home or classroom! Here’s a hint – all of the answers can be found in our Fall 2018 / Winter 2019 10thanniversary edition at http://www.inspirationsnews.com/pdf/Editions/Inspirations_2018_fall-web.pdf. CHANGE THE STORY: The Beat 92.5 FM anti-bullying project with the EMSB called Change the Story has continued. Initially, it was on air personalities from The Beat. Now a number of EMSB staff have done so. Click on the names to see the videos. Arctic players with Pierre de Coubertin staff and students. ARCTIC AT COUBERTIN: The Montreal North Arctic Junior AAA team continued their “Stay in School” tour of East End EMSB schools with a visit to Pierre de Coubertin Elementary in St. Léonard. 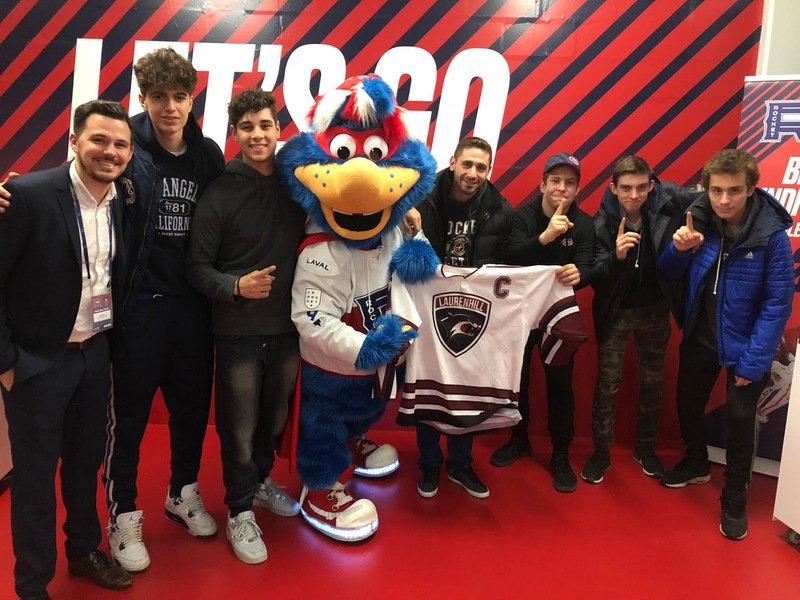 Team Vice-President Lina Di Giovanni was accompanied by players Christiano Paterno, Benedic Jobin, Tristan Lortie and Kristopher Joseph. Paterno is a Pierre de Coubertin grad and he received a warm welcome. Former Pierre de Coubertin student Paterno gets a warm welcome. The players first spoke about their present-day pedagogical priorities and how they are combined with hockey. They then took part in an entertaining scrimmage with the students. On Wednesday night, November 14, many Pierre de Coubertin students and staff will be in attendance at the Arctic home game. Thanks to Principal Ida Pisano, Vice-Principal Ruben Azvedo and physical education and health teacher Patrizia Granaudo, who was pleased to see her former student Paterno again. See our story. 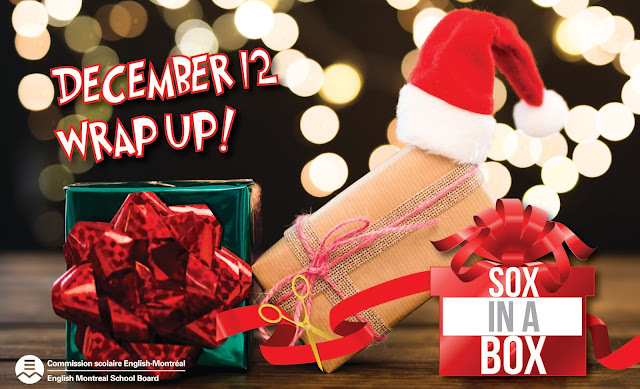 SOX IN THE BOX: Dalkeith, Gerald McShane, Honore Mercier, Pierre de Coubertin, and Rosemount High will be embarking on the third annual "Sox in a Box" Campaign. It will be spearheaded by administrative teams and staff members of each school, alongside Spiritual Community Animator Vince Lacroce. The intent of the project is to encourage students and staff members to donate new socks (all ages) for five shelters in Montreal. The following organizations will be benefitting from the school donations: The West Island Women's Shelter, Dans La Rue, Chez Doris, St. Michael’s Mission and the Mile End Mission. Each school will create personalized holiday gift boxes containing new socks with bilingual messages of hope for the holiday season. On December 12, staff members, students from each school alongside charity representatives will join together in Rosemount High School's Spiritual Community Centre for a holiday luncheon and to personally gift wrap each donation. For more information, please contact Vince Lacroce: vlacroce@emsb.qc.ca. RETHINK HOMELESSNESS AT ROSEMOUNT HIGH SCHOOL: With the winter quickly approaching, students and staff at Rosemount High School (3737 Beaubien) will host Rethink Homelessness on December 3. Rethink Homelessness is a summit meant to foster a candid discussion about the plight of the homeless in Montreal.The summit will consist of testimonials from homeless Montrealers and shelter representatives, with the intention of addressing the stigma of mental illness, life on the streets and reintegration programs. Ultimately, the goal is to help both students and staff understand the needs of others in difficult situations, putting empathy and compassion into action. Participating in the education awareness program will be St. Michael’s Mission and Chez Doris. Currently, over 70 students from Rosemount High School continuously volunteer at various soup kitchens and shelters across the island. For more information, please contact Vince Lacroce, Spiritual Community Animator at vlacroce@emsb.qc.ca. BUTTERFLY PROJECT: The Carlyle Elementary School students in Town of Mount-Royal have been learning about the life cycle of butterflies and the importance of caring for the environment as part of the STEAM initiative. 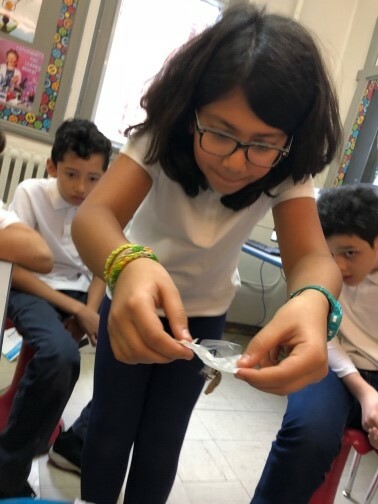 Students observed the life cycle of Monarch butterflies, each step of the way (from larvae, to caterpillar, to chrysalis, and finally, emerging as butterflies). These butterflies and materials were generously donated from Sonia Bujold, a lab coordinator from the Biology Department at McGill. The students were responsible for caring for these butterflies throughout their life cycle by transferring the caterpillars to tiny egg cartons, moving the cocoons into the larger tent, and finally, caring for the butterflies during the brief period after they hatched out of their cocoons by watering their wings and providing them with food. Students were also exposed to the American Indian Legend prior to releasing the butterflies into their natural environment, right before migration. The butterfly release was a nice ending to this collaborative project between grade one and grade five students. Nicholas Doyon (left) at the session. QPAT PRESENCE: The EMSB once again had an information table at the Quebec Provincial Association of Teachers (QPAT) Convention November 8 and 9 at the Hyatt Regency Hotel attached to Complex Desjardins. 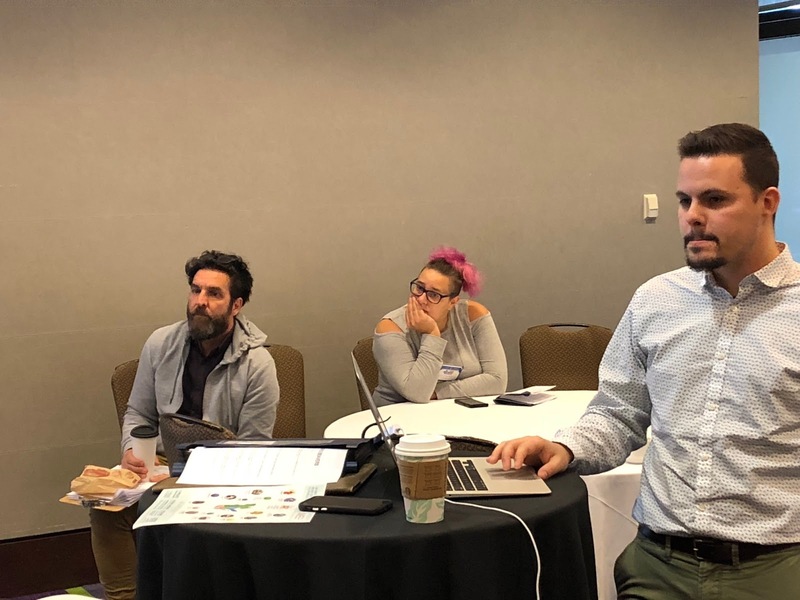 Pedagogical Consultant Nicholas Doyon was integrally involved in the annual Spotlight on the Arts, a series of dynamic workshops, an interactive art-making space for educators and a collaborative art experience for students. Each workshop provided art specialists and generalists alike with creative classroom practices and approaches applicable to developing arts competencies, as well making clear and tangible connections to other parts of the curriculum. One session was moderated by Thibault Zimmer from the Montreal Museum of Fine Arts on the subject of Educart, wherein teachers can create and publish their own multi/interdisciplinary lesson plans. Mr. Doyon also gave a session on integrating character masks in drama class. Completing work on a bench. 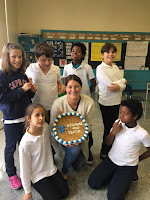 JP I STEAMING AHEAD: John Paul I Junior High School in St. Léonard has embarked on a Kindness campaign, guided by the IB learner profile attributes such as caring, communicators, knowledgeable, open-minded and reflective along side with inspiration from our neighbouring schools. Spreading the importance of a safe, empowering and motivating space, English, French, Spanish, Art and Math classes have collaborated on a STEAM project, creating a bench for the student lounge. JPI students have chosen words and created quotes of inspiration, kindness and motivation in English, French and Spanish. Words to be designed with specific skill techniques by the art department and sealed to our new piece of furniture forever. 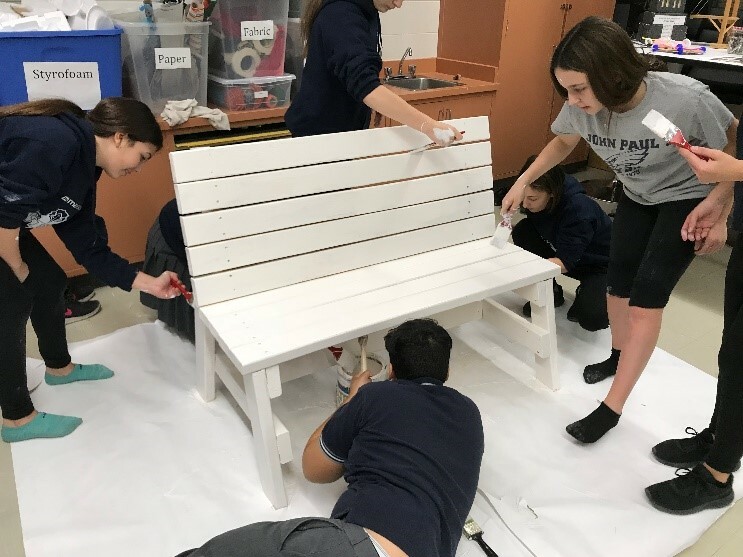 Math students, having to use ratios and proportions, have calculated the dimensions and costs of our real-life sized bench from a miniature prototype. Volunteering students in these subject groups have learned carpentry skills throughout the process under adult supervision. SCIENCE FAIR: The annual Hydro-Québec Montreal Regional Science & Technology Fair will take place Sunday, March 24, through Tuesday, March 26, on the downtown campus of Concordia University. Organized by Educational Alliance for Science & Technology (EAST), in partnership with Concordia University, this is the third successive year that the Fair will be hosted at Concordia and a recent agreement now extends that through 2020. During this one-of-a-kind competition, budding scientists aged 13 to 20 will be presenting their scientific projects to visitors in creative and accessible ways that express their passion for science and technology. 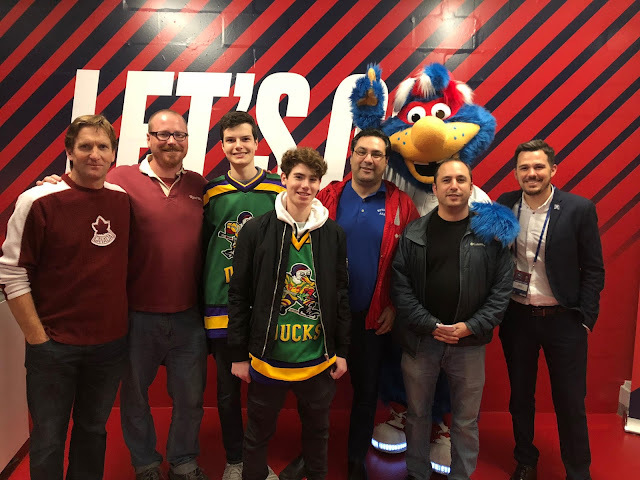 The Lester B. Pearson HS delegation at the Rocket game, with Denis Voutos and mascot Cosmo. 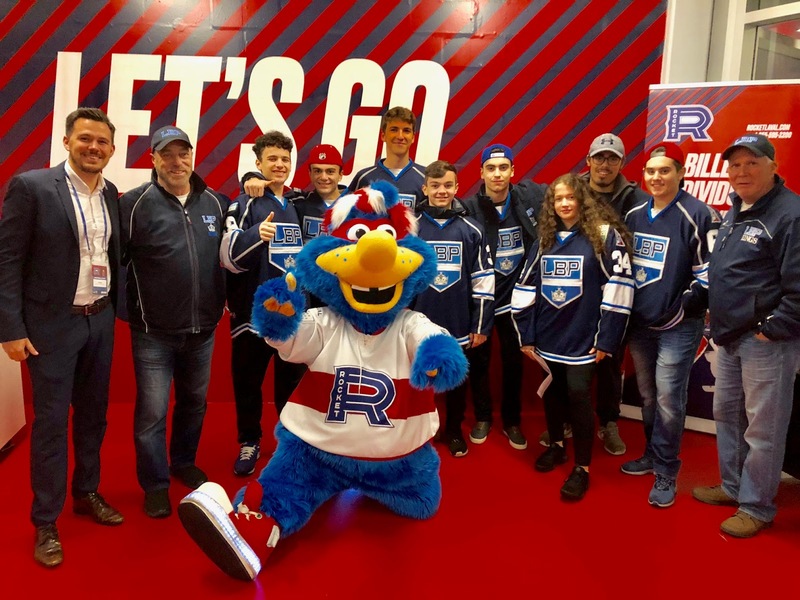 ROCKET LAUNCH: The EMSB was represented at the Laval Rocket American Hockey League game versus the Bellevue Senators on October 31 by the LaurenHill Academy hockey team and coach Shawn Sacco, Royal West Academy Principal Tony Pita with some staff and students and Lester B. Pearson High School in Montreal North Sports Études hockey coach Jean Roy and his players. Denis Voutos from group sales, a graduate of LaurenHill, was there to greet them. Denis Voutos, Cosmo and the LaurenHill delegation. Schools can hold their own fundraisers with the team, getting tickets at a special price and earning bonuses for each one sold. Email DVoutos@RocketLaval.com. Two official Rocket visits are planned for February 4 at Gardenview and March 11 at Gerald McShane. Denis Voutos and the Royal West delegation. OPEN HOUSES: Noted athlete Dwight Walton, who works at John F. Kennedy Adult Education Centre, gave a shout out to the high school open house. Here it is. ART MONTH: October was Art Month and the Galileo Adult Education Centre’s SIS (Social Integration Services) Art Class held its first Art Sculptures vernissage. The clay works were figure and still life sculptures created by students who participated in the non – directive, exploratory expressive art activity. Art teacher and therapist, Miss Erica, explained and demonstrated techniques in the form of an open – ended instruction allowing students to interpret in their own expression, voice and style. This therapeutic art class focused on sensory and motor development persuading students to work with their body in space and relate their reality to their creativity. The creative expressive art process of sculpture making allowed students to see the process of self – fulfillment of creating an art piece from start to finish. The length of the project was an intensive six weeks. The art sculptures are in a permanent installation displayed in the main lobby of Galileo Adult Education Centre. GALILEO WINNERS: March of Dimes Canada has awarded five SIS students from Galileo Adult Education Centre in Montreal North with a free Smart tablet as part of their Assistive Mobilie Technology initiative. 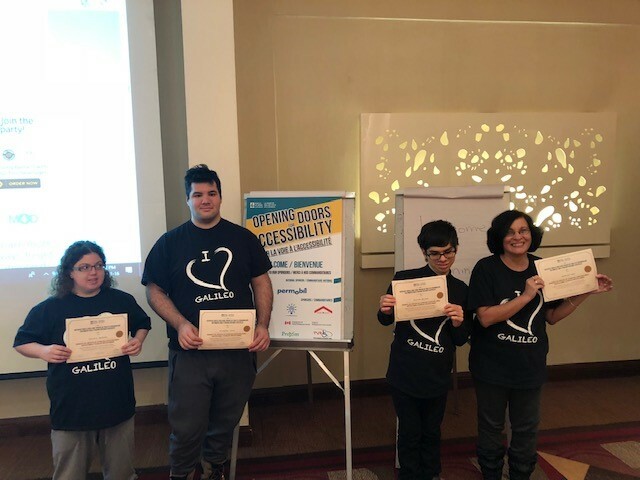 On Friday November 16, five students attended the March of Dimes “Opening Doors for Accessibility” seminar, where they celebrated their win with seminar attendees from across the Greater Montreal and surrounding areas. Leonard Baker, CEO and director of the March of Dimes Canada, personally awarded each student with an authentication certificate, which gives the students access to ordering free hardware and software unique to their individual needs, style and taste. In order to be considered for the tablet, each student had to complete an application form, which included sharing their story and how the assistive technology will improve their day to day living and make it easier for them to communicate and research. Galileo students face various physical and/or development disabilities and challenges. These tablets will enable them to be more independent, and to work, learn and participate fully in their community. March of Dimes Canada believes that everyone, regardless of physical or financial challenges deserves the same opportunities. Its mandate to serve the broader needs of all adults with physical disabilities, regardless of whether the disability was a result of a disability at birth, the polio virus, an accident, or even due to aging. Congratulations to winners Gabriel Rodzen, Caterina Pupo, Alexander Ponte, Nicolas Mariano and Concetta Barbieri. A huge thank you to all participating teachers and the March of Dimes representatives Lisa Slipetz and Mary Lynne Stewart. John Alea and Derek Curzi. PODCAST ON ST. PIUS CHEF: Barry Morgan recently visited the St. Pius X Culinary Institute in Ahuntsic for the EMSB podcast and sat down with Chef/Instructor Derek Curzi and one of his students, John Alea. Derek is a former student at the Institute and also studied cooking in Belgium. 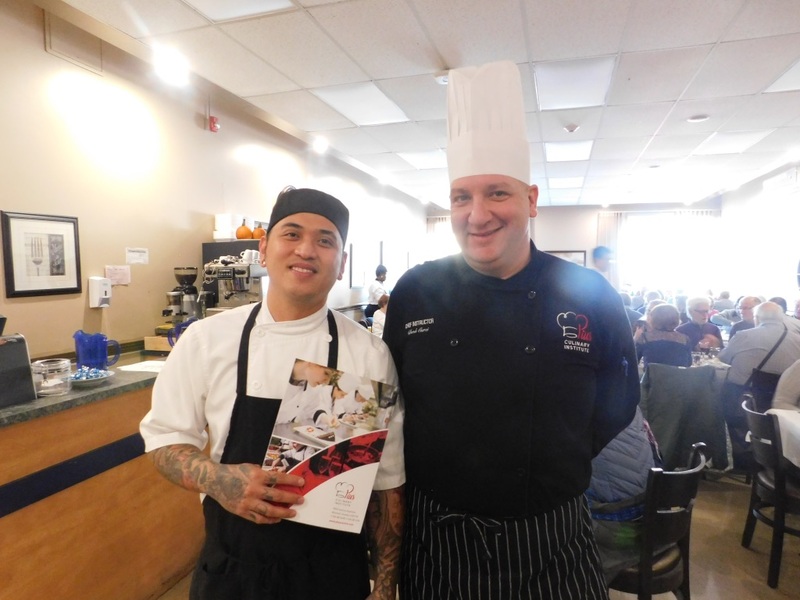 He discusses the program, how long it lasts and what it takes to become a chef. John will soon be graduating from the program and he talks about what he has learned at the St Pius X Culinary Institute. Derek and John also talk about some of their favorite dishes as well as the Institute's dining room, a terrific spot, open to the public, for lunch and dinner. You can listen to it here. AN AEVS PRIMER: Did you know that students who attend an EMSB adult or vocational centre can open the door to a very lucrative career? There is a wealth of opportunity and possible career paths accessible through the EMSB's vocational centres that can lead students to success. Academic Advisor Miriam Furfaro and Assistant Director of Adult Education and Vocational Services Angela Spagnolo held a workshop during the recent EMSB Parents Conference at the St. Laurent Adult Education Centre. 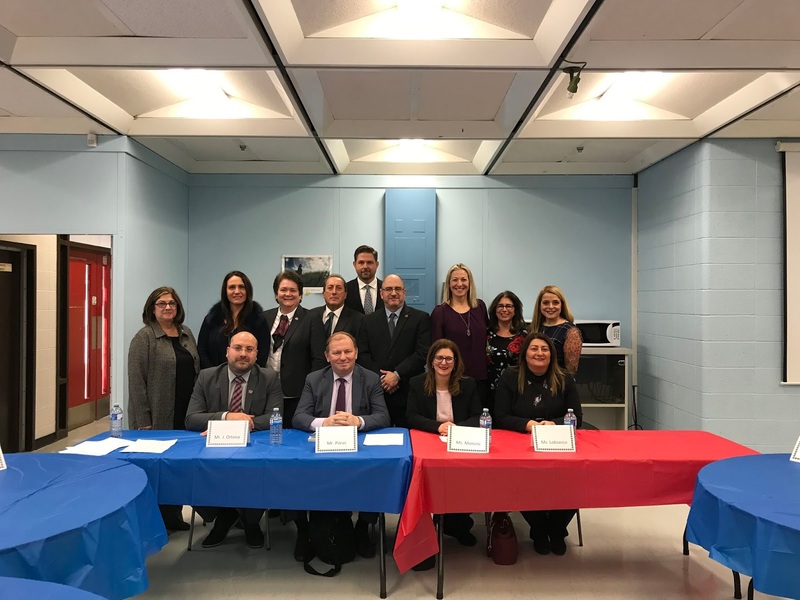 The theme was "Transitions - Building your future with AEVS.” This workshop explored the different options and services the EMSB’s vocational education department (AEVS) can offer. See the full report here. Nick Katalifos and Mayor Brownstein. CANNABIS INFO MEETING: The City of Côte Saint-Luc held an information session regarding the legalization of cannabis. The federal law legalizing cannabis came into effect on October 17. The new Quebec Cannabis Regulation provides that, for 90 days, a lessor may modify the conditions of the existing lease of a dwelling by adding a prohibition against smoking cannabis. The city discussed how the city plans to update current bylaws related to use of cannabis in public spaces and get feedback from the public. Wagar Adult Education Centre Principal Nick Katalifos attended the session and spoke with Mayor Mitchell Brownstein. ÉTATS FINANCIERS 2017-2018 DE LA CSEM: Les états financiers vérifiés 2017-2018 ont été présentés lors de la récente réunion du conseil. L’excédent net d’exploitation pour 2017-2018 est légèrement en deça de 1 million de dollars. Cette somme s’ajoute à notre surplus accumulé que le conseil peut affecter à raison de 15 pour cent par année au cours des deux prochains exercices financiers. Le conseil s’est dit ravi de pouvoir utiliser en 2018-2019 près de 6,5 millions de dollars à même le surplus accumulé au 30 juin 2017 pour offrir des services continus aux élèves, notamment la mise en place de nouvelles initiatives et des allocations directes versées aux écoles et aux centres dans le but d’y apporter des améliorations. NOUVELLES ENSEIGNES: La CSEM procédera à l’installation de nouvelles enseignes sur les bâtiments de l’ensemble de ses écoles et centres. Le coup d’envoi de cette initiative a véritablement été donné avec l’enseigne du nouveau Centre Mackay/école Philip E. Layton. Cette nouvelle enseigne a été installée il y a deux semaines et servira de modèle pour les autres à venir. La firme Ponctuation Grafix en a réalisé la conception de concert avec le groupe de discussion du Service du marketing de la CSEM et le conseil des commissaires. 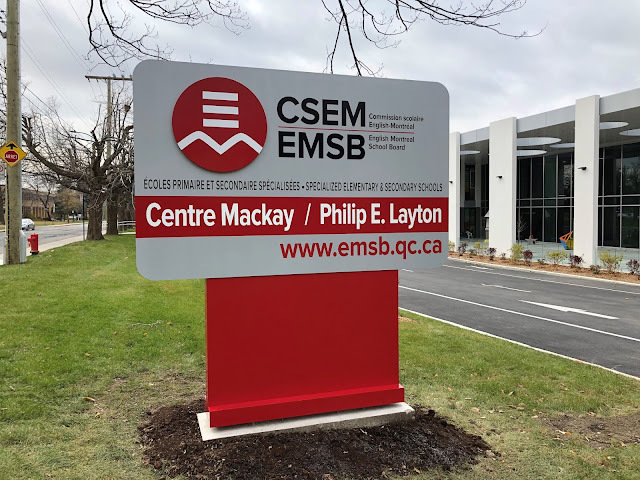 NOUVEAU SITE WEB: La CSEM a officiellement procédé au nouveau lancement de son site Web phare (emsb.qc.ca). Cette réalisation aura nécessité plusieurs années de travail. Figurent sur la photo (de gauche à droite), la secrétaire générale de la CSEM Nathalie Lauzière; le spécialiste en communication et marketing Michael Cohen; la webmestre Nur Erdem; la conceptrice principale Andrea Di Tomaso et David Verrillo technicien de réseau, ainsi que William Hawker (gestionnaire du projet) des Services éducatifs et de la technologie. Notre nouveau site moderne et réactif est adapté aux appareils de bureau et mobiles. Il assure la diffusion des notifications d’urgence à la grandeur de la Commission et permet de partager aisément de l’information entre les sites. Nous procéderons au transfert des sites de nos écoles primaires et secondaires sur la même plateforme au cours des 12 à 24 prochains mois. Les sites Web des écoles sont maintenant automatiquement redirigés vers leur propre domaine (nom de l’école.emsb.qc.ca.). C’est tout à fait normal et les écoles peuvent choisir de continuer à utiliser leur ancienne adresse électronique (www.emsb.qc.ca/nom de l’école). Toutefois, les liens vers les sous-pages mises en signet pourraient ne pas fonctionner. Si c’est le cas, il suffit de supprimer vos favoris, d’accéder à la page à partir du site Web et de l’ajouter à nouveau à vos favoris. Nous vous invitons à nous faire part de vos commentaires à webservices@emsb.qc.ca. 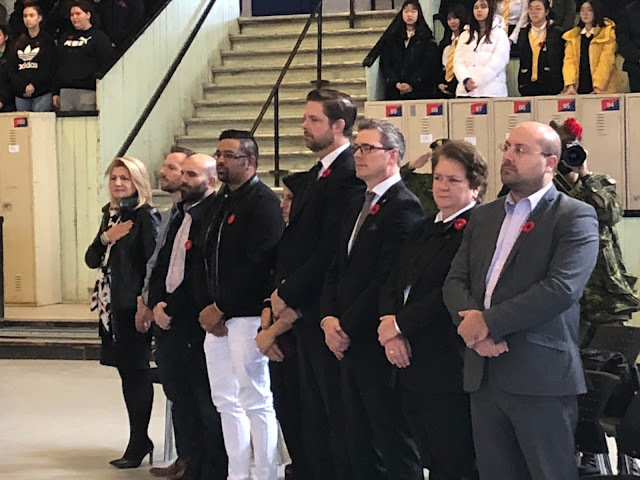 DÉLÉGATION HOLLANDAISE: Le 15 novembre, l’école East Hill - choisie parmi plusieurs pour vivre une expérience des plus intéressantes - a accueilli fièrement 21 professionnels de la Hollande (enseignants, administrateurs et conseillers pédagogiques). Les autorités pédagogiques hollandaises, qui étudient présentement un modèle d’éducation bilingue hollandais-anglais, ont été éblouies par la facilité et la fluidité avec lesquelles nos élèves s’expriment en anglais et en français, sans compter l’italien comme langue complémentaire. Le personnel et les élèves ont ouvert leurs salles de classe et leurs cœurs à cette délégation hollandaise qui a pleinement apprécié sa visite et est repartie avec une foule d’innovations et de pratiques exemplaires à adopter dans son propre pays! Sandra Furfaro, directrice des Services éducatifs et de la technologie à la CSEM, a coordonné ce merveilleux projet et était présente lors de la visite. En quête de nouveautés, la délégation a également rendu visite à l’école secondaire Rosemont et à l’Institut culinaire St. Pius X. Tout un honneur! J’ADORE LA LECTURE: Novembre est le mois « J’adore la lecture » (I Love to Read Month). L’école primaire Elizabeth Ballantyne à Montréal-Ouest prendra part à une série d’activités de lecture afin d’inciter les élèves à lire le plus possible pour développer le goût de la lecture. Cette année, en vue de soutenir le thème de leur foire annuelle du livre et pour illustrer les aventures magiques qui s’offrent aux jeunes par le biais de la lecture, le thème choisi est la forêt enchantée! Le corridor menant au gymnase a donc été transformé pour l’occasion en une superbe forêt enchantée où des personnages imaginaires tels des fées, des magiciens et des lutins peuvent y vivre! Pour donner le coup d’envoi au mois « J’adore la lecture », les élèves traversent la forêt enchantée et pénètrent dans le gymnase pour assister à une pièce de théâtre qui raconte l’histoire d’un magicien et de trois fées, interprétée par le directeur Michael Brown, et les techniciennes en comportement Mmes Roen, Carmy et Kate. C’est d’ailleurs durant cette pièce de théâtre que les élèves ont reçu leur première tâche de lecture! Le grand magicien a raconté l’histoire de deux fées chassées de la forêt enchantée puis reléguées dans les ténèbres par la méchante fée. Les élèves ont ensuite été invités à faire leur part pour secourir les deux fées prisonnières. Le grand magicien leur a expliqué que chaque fois qu’une classe lit 50 livres, elle reçoit une empreinte de pied pour permettre aux fées de retourner chez elles, un pas à la fois. PROGRAMME AIMER: Le 24 octobre, le Réseau Enfants-Retour a offert aux animateurs de vie spirituelle et d’engagement communautaire la formation AIMER (SHINE, en anglais). Créé l’an dernier, ce programme vise à outiller les élèves. L’acronyme AIMER est pour Affirmation, Image de soi, Mettre ses limites, Égalité et Relations saines. Ce sont tous des thèmes fort pertinents qui s’inscrivent dans le nouveau cours d’éducation à la sexualité du gouvernement du Québec. Les animateurs de vie spirituelle et d’engagement communautaire sont désormais qualifiés pour animer des formations AIMER dans leurs écoles. Ils travailleront en collaboration avec le Réseau Enfants-Retour afin de véhiculer cet important message à tous les élèves. 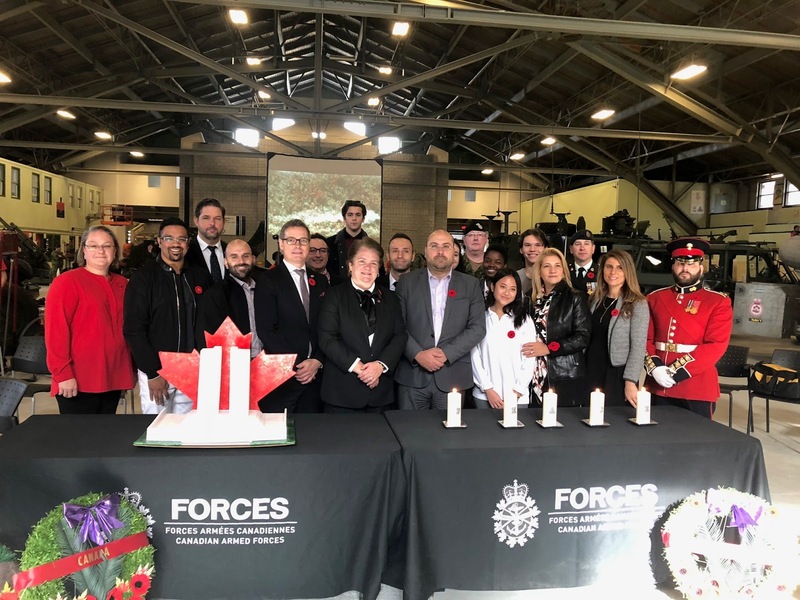 JOUR DU SOUVENIR: Plus de 700 élèves ont pris part à la plus grande célébration du jour du Souvenir organisée jusqu’à présent par la CSEM, au Royal Canadian Hussars sur le chemin de la Côte-des-Neiges, le 7 novembre. 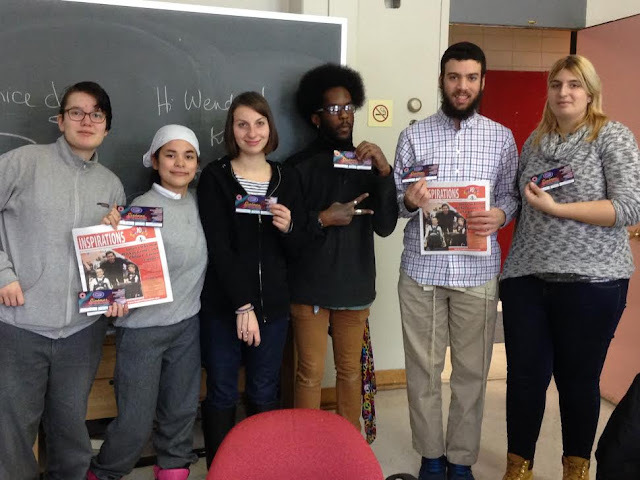 Des élèves de six écoles de la CSEM – l’école secondaire Laurier Macdonald à Saint-Léonard, l’école secondaire Lester B. Pearson à Montréal-Nord, l’Académie Marymount à NDG, l’école secondaire Perspectives I et Perspectives II à Saint-Michel et l’école secondaire Rosemont – ont participé à la commémoration du 100e anniversaire de l’armistice de la Première Guerre mondiale, le 101e anniversaire de la bataille de la crête de Vimy ainsi que le 80e anniversaire de Kristallnacht. À cette occasion, M. Willie Glazer, survivant de l’Holocauste et vétéran canadien âgé de 98 ans, a pris la parole. Il a également allumé six chandelles à la mémoire des 6 millions de Juifs qui ont péri durant la Deuxième Guerre mondiale. CHANGEMENT DE PERSONNEL: Mme Christine Denommée quittera son poste de directrice du Service des ressources humaines à la CSEM pour assumer les fonctions de directrice des relations de travail au CPNCA (Comité patronal de négociation pour les commissions scolaires anglophones). M. Charambalos (Bob) Thomas est le nouveau directeur adjoint des Services éducatifs et de la technologie. Il succède à Luigi Di Filippo qui s’est joint à Bombardier. Aux côtés de Kacem Azzouni, M. Thomas sera chargé de la supervision de l’infrastructure de nos logiciels et devra veiller au bon fonctionnement de l’équipement et du réseau. Ex-enseignant, il a également été conseiller pédagogique et directeur des TI à la Commission scolaire Riverside et à la Commission scolaire New Frontiers. BONTÉ ET SANTÉ MENTALE: L’animateur de vie spirituelle et d’engagement communautaire Rocco Speranza a souligné l’étroite relation qui existe entre les gestes de bonté et l’amélioration de la santé mentale observée au cours des mois de septembre et d’octobre. Au Collège Vincent Massey, il a fait équipe avec l’agent de police Guay afin de présenter des ateliers aux élèves de 1re et 2e secondaire portant sur la cyberintimidation, la santé mentale et les gestes de bonté. Par la suite, les élèves du comité Be The Change ont rédigé à l’heure du dîner des messages positifs sur des feuilles de couleur qu’ils ont ensuite fixées sur la murale de l’école intitulée Don’t Leaf. À l’école primaire Edward Murphy, c’est le Réseau Enfants-Retour et M. Speranza qui ont présenté le populaire programme AIMER (SHINE) visant à accroître la bonté, la confiance et l’estime de soi chez les jeunes. Les élèves de l’école East Hill étaient tout sourire à la suite du passage de M. Speranza dans les classes. Ce dernier leur a expliqué comment la gentillesse et la compassion peuvent contribuer au bonheur de chacun et à celui d’autrui. Des études sur les effets du bonheur ont démontré qu’un seul petit geste de bonté peut contribuer à diminuer le stress, la tristesse et l’angoisse, tout en augmentant les niveaux de sérotonine, d’endorphine et d’oxytocine qui favorisent chez les gens un sentiment de calme, de bien-être et de joie. À la suite de ces présentations, un plus grand nombre d’élèves ont pris conscience de la grande portée des gestes de gentillesse et nous espérons que cette vague de bonté se poursuivra. CONFÉRENCE INFLUENCE MTL: Huit jeunes filles fort enthousiastes du Collège Vincent Massey ont récemment eu l’occasion rêvée d’assister à la conférence Influence MTL qui vise à promouvoir et faire valoir la diversité, l’inclusion et le leadership. 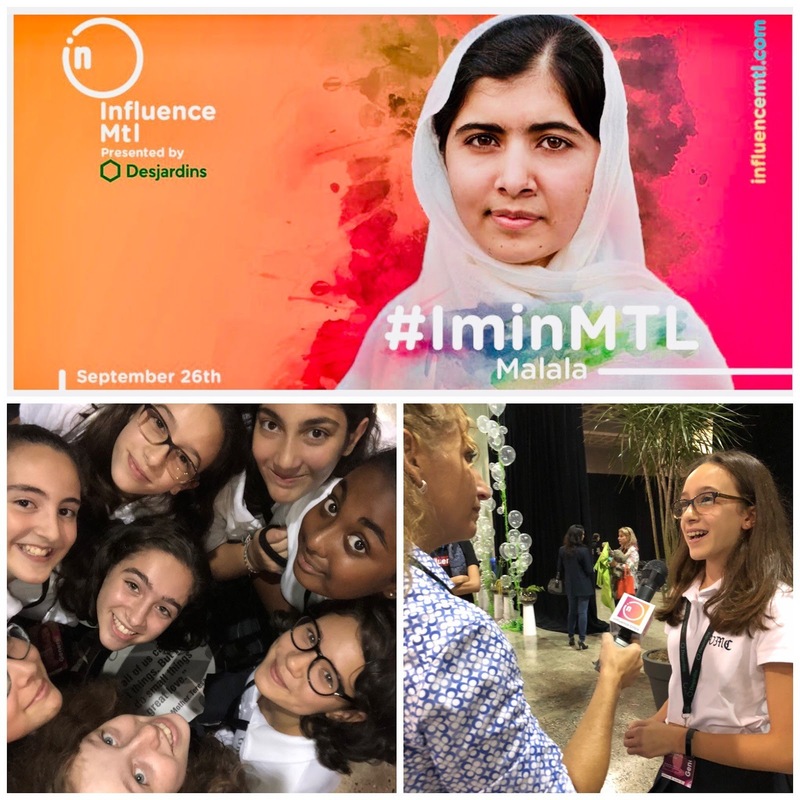 Elle a pour mission d’inspirer, d’informer et d’influencer la génération actuelle et les futures générations de leaders, d’entrepreneurs, d’activistes, de créateurs, de professionnels et d’étudiants en encourageant les échanges avec des personnes influentes locales et internationales afin d’avoir un impact positif sur leur écosystème respectif. Cette année, Malala Yousafzai fut la conférencière d’honneur. Née en 1997, Malala a grandi dans le nord du Pakistan. Dès l’âge de 10 ans, elle a milité en faveur du droit des filles à l’éducation. En octobre 2012, à l’âge de 15 ans, Malala a été victime d’une tentative d’assassinat de la part des Talibans à bord de l’autobus où elle prenait place avec ses amis alors qu’elle revenait de l’école. Elle étudie présentement à l’Université d’Oxford et continue à mener sa campagne pour que tous les enfants aient le droit de fréquenter l’école. Depuis cet attentat, Malala a acquis une renommée internationale pour son courage devant son refus de se laisser réduire au silence et la poursuite de son combat afin que tous puissent jouir du droit à la scolarisation. Sa bravoure et son dévouement inlassable envers sa cause lui ont valu des éloges des quatre coins de la planète, y compris la plus prestigieuse distinction au monde : le prix Nobel de la paix. Elle est devenue la plus jeune lauréate de ce prix en 2014, aux côtés de Kailash Satyarthi, défenseur indien des droits des enfants. Devant l’ampleur du soutien qu’elle a reçu durant cette épreuve, Malala a créé un fonds international – le Fonds Malala – pour la promotion du droit des filles à l’éducation partout dans le monde. SANTÉ MENTALE: Les membres du Centre de ressources en santé mentale de la CSEM ont assisté récemment à un concert de Robb Nash à Saint-Hubert. Dans le cadre de sa tournée des écoles secondaires qui le mène d’un bout à l’autre du pays, Robb a partagé avec les élèves de Saint-Hubert sa propre expérience lorsqu’il a frôlé la mort, leur a raconté des cas vécus d’adolescents aux prises avec des troubles de santé mentale et a interprété des chansons rock inspirantes pour donner espoir à la jeunesse canadienne. À ceux qui ont des amis ou des membres de leur famille touchés par des troubles de santé mentale, Robb les a encouragés à aller vers eux, sans porter de jugements, pour leur offrir du soutien. Et à ceux qui vivent avec des problèmes de santé mentale, il les encourage à ne pas baisser les bras et à aller chercher de l’aide auprès d’une personne de confiance. Les représentants du Centre de ressources en santé mentale ont été tellement impressionnés devant le message véhiculé par Robb et sa portée sur les élèves qu’ils s’affairent présentement à organiser une performance de l’artiste à la CSEM. LE MOIS DES ARTS: Le mois d’octobre étant dédié aux arts, la classe des arts des services d’intégration sociale (SIS) du Centre d’éducation des adultes Galileo a organisé sa toute première exposition de sculptures. Les œuvres d’art en argile représentaient des visages et des natures mortes créés par des élèves ayant participé à l’activité artistique expressive, exploratoire et non dirigée. Enseignante en arts et thérapeute, Mme Erica a présenté et démontré les techniques sous forme d’un enseignement libre permettant ainsi aux élèves d’y aller d’une interprétation qui reflète leur propre expression, voix et style. Ce cours d’arts thérapeutiques est axé sur le développement moteur et sensoriel en invitant les élèves à mettre leur corps à contribution dans l’espace et à établir un rapport entre leur réalité et leur créativité. Par le biais de la créativité et de l’expression, la création de sculptures a permis aux élèves de vivre un sentiment d’auto-accomplissement en réalisant une œuvre d’art de toutes pièces. Ce projet s’est échelonné sur une période intensive de six semaines. Les sculptures sont exposées en permanence dans le hall principal du Centre d’éducation des adultes Galileo. DES LAURÉATS À GALILEO: Dans le cadre de l’initiative de technologie d’assistance mobile lancée par La Marche des dix sous du Canada (March of Dimes Canada), cinq élèves des SIS du Centre d’éducation des adultes Galileo se sont mérités chacun une tablette intelligente! Le vendredi 16 novembre, les élèves ont assisté au séminaire « Ouvrir la voie à l’accessibilité » de La Marche des dix sous. À cette occasion, les élèves de Galileo ont célébré leur victoire en compagnie d’autres lauréats de la grande région de Montréal. M. Leonard Baker, président et PDG de La Marche des dix sous a remis personnellement à chaque élève un certificat d’authentification leur donnant droit de commander gratuitement du matériel et des logiciels adaptés à leurs besoins spécifiques, leur style et leurs préférences. Pour courir la chance de remporter une tablette, les élèves devaient mettre par écrit leur histoire. Ils devaient expliquer en quoi la technologie d’assistance contribuerait à améliorer leur quotidien et les aiderait en général à communiquer et effectuer des recherches. Nos élèves souffrent de divers troubles physiques et du développement, et sont confrontés à plusieurs défis. Ces tablettes les aideront à accroître leur autonomie, à travailler, apprendre et être pleinement actifs au sein de leur communauté. La Marche des dix sous du Canada estime que toute personne, en dépit d’obstacles physiques ou financiers, devrait avoir les mêmes chances. Cet organisme a pour mandat de répondre aux besoins plus vastes de tous les adultes atteints d’invalidités physiques, que cette condition soit de nature congénitale, due au virus de la polio, à un accident ou même au vieillissement. Nous offrons toutes nos félicitations à tous les gagnants : Gabriel Rodzen, Caterina Pupo, Alexander Ponte, Nicolas Mariano et Concetta Barbieri. Nous tenons également à remercier tous les enseignants participants ainsi que les représentants de La Marche des dix sous, Lisa Slipetz et Mary Lynne Stewart, de même que Wendy Singer représentante pour la région de Montréal.